The SCA's back room boffins and their clever little coding elves have been busy doing some fiendishly clever things with computers of late, and they are nearly ready to launch a full blown cartie simulator on the unsuspecting gravity racing world. 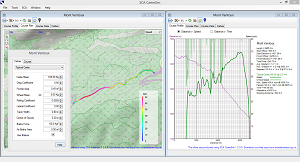 SCA CartieSim is a application that can predict the speeds of a cartie at any point on a course from some simple data describing the cartie and the coordinates of the course. The course can be loaded from a GPS data file or, if you don't have access to that, then a simple route from Google Maps or Google Earth can be loaded instead. Taking into consideration such variables as overall mass, drag factor and rolling resistanc along with the gradient and turn radius of the course, the application plots a profile of speed against distance and can even identify sections of the course where you may need to use your brakes! The program is currently in its final testing phase, and the first production version should be available in the next few weeks. Submitted by scottishcarties on February 11, 2011 - 01:26. WOW! This looks excellent, what a brilliant tool! Even more "wow" is the prediction of a top speed of almost 79mph - !!!!!!!!!!!!!!!!!!!!! In reality, probably a bit lower than that. Those big "critical speed" stalactites show where you'll need to brake. In reality, probably not much about 70mph. Still fast enough though. On which hill did you clock 49 at Cadwell? The figures at http://www.adventuresofgreg.com/HPVlog/01-09-05.html are not drag coefficient (Cd) but drag area (CdA). CartieSim separates out the two terms and you need to enter both the frontal area (A) and the drag coefficient (Cd). Some typical Cd values are here and here. If you want to use drag area (CdA) instead of drag coefficient (Cd), you'll need to set the area to 1 regardless of what the real area is. Unfortunately we ran into a few unexpected delays when we discovered that the "standards" for GPS data files are rather variable in their implementation. We're right in the middle of getting ready for Cairngorm Soapbox Extreme so are a bit pushed or time at the moment, and are hoping to have something available software-wise in August. 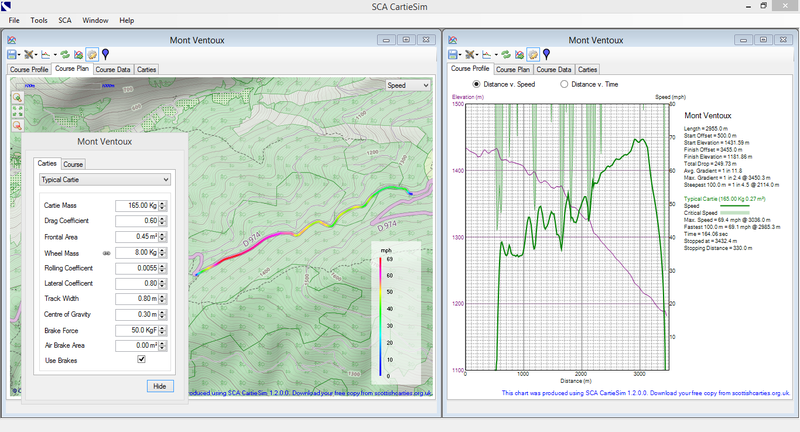 Team Caiman's final run at CSEX2011 (SatNav data, in red), with predicted speeds in green. Speed data logged by Night Train at CSEx2011 (in red) with predicted speeds shown in green.